With today’s plastic-framed Glocks and Keltecs, aesthetics have been sacrificed on the altar of functionality. Not so in the early 20th century — in that period, the best firearm designers created guns that looked as good as they worked. One example is the classic Colt Woodsman. This design came from the legendary John Moses Browning and was later refined by Colt before the pistol’s introduction in 1915. The Colt Woodsman’s frame design evolved over time in three distinct series: Series One 1915–1947, Series Two 1947–1955, and Series Three 1955–1977. Shown below is a stunning Carbonia-blued and engraved Third Series model with ivory grips. You can see this lovely Colt and countless other fine firearms at the NRA Museum in Fairfax, Virginia. The Museum is open every day from 9:30 am to 5:00 pm, and admission is free. Now through April 20, 2015, the Museum hosts a Theodore Roosevelt exhibit: “The Trappings of an Icon”. This includes Roosevelt memorabilia on loan from Sagamore Hill National Historic Site. 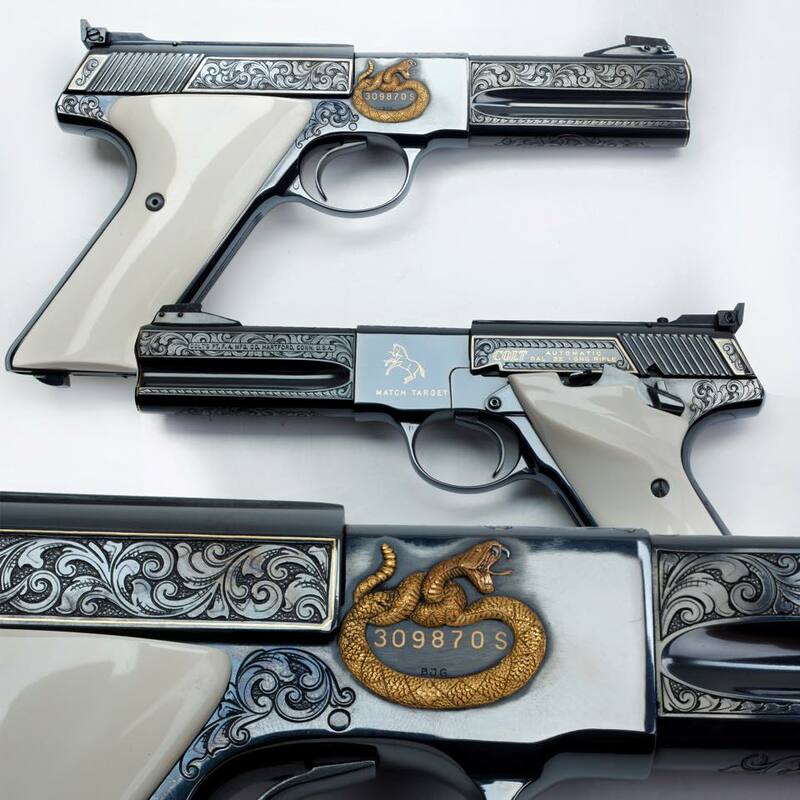 Share the post "Engraved Colt Woodsman — Blued Beauty by J.M. Browning"
READ CBS Story about Rich Wyatt Arrest in Colorado. Lesson: Don’t sell firearms if you don’t have a valid Federal Firearms License. 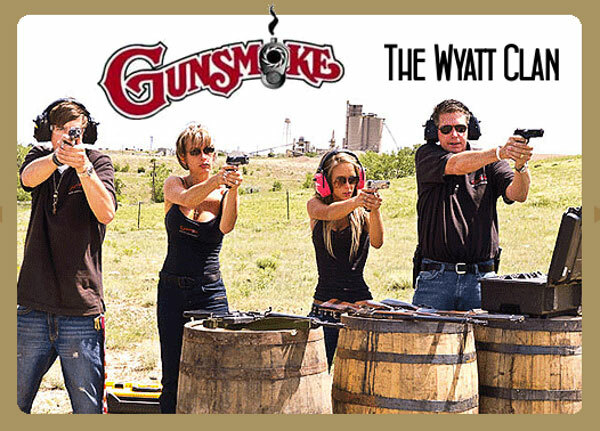 Gunsmoke, the Wheat Ridge, Colorado firearms emporium featured on the Discovery Channel’s reality TV show American Guns, has been raided by the Feds. ATF and IRS agents swooped into the Gunsmoke shop last week, culminating an investigation into alleged improper gun transactions. Firearms were seized from Gunsmoke’s inventory and carted away in federal vans. Run by Rich Wyatt and his wife Renee, Gunsmoke earned notoriety for Rich’s salesmanship and the revealing clothing worn by his wife and his daughter. The show highlighted Rich’s ability to sell firearms for what were often shockingly high prices. There was one problem though… Wyatt had voluntarily surrended his FFL some time ago. Consequently, Gunsmoke’s firearms transfers were being conducted through a third party. Apparently the Feds did not like the arrangement. Those who have watched the Wyatts on the Discovery Channel may not be surprised by this outcome. It seemed like Rich Wyatt’s signature talent was selling guns at outrageously inflated prices (if the sales price quoted on the show are to be believed). As for the alleged “gunsmithing” done in the Gunsmoke shop… well it certainly was creative. You could definitely learn what NOT to do to a fine firearm by watching the Gunsmoke TV show. Share the post "Gunsmoke Store Raided in Colorado"